Go down to the gym and you will always find one, massively muscled and toned, likes to pose in front of the mirror, and they know that everyone is looking at them. 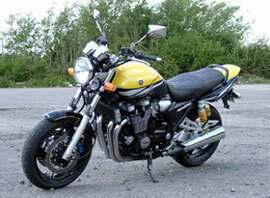 If Yamaha's XJR was a human, I'd hazard a guess that it would be just that type. Compare the XJR1300 to a modern race rep and it's a bit of a bouncer, it would look more at home on the door of the local nightclub than poncing around down the local lanes! It really is a huge bike, it's squat and looks brutal, has an enormous in-your-face engine, twin Ohlins rear shocks for pure show, and weighs in at a massive 230kg dry. 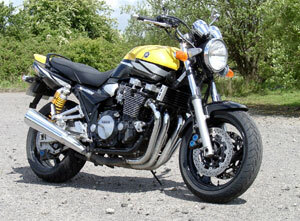 The current XJR1300 is based loosely around the old FJ1100 engine which started life in 1984. The current XJR13 has an extra 100cc over the previous 1200cc version and now puts out a respectable 105bhp and a seriously impressive 76ft-lbs of all important torque. The advantage of having such a well-established engine like this is the wealth of tuning knowledge accumulated over the years through various people. I hear through the grape vine that it's really easy to get the power output up to a healthy 120bhp. All one needs to do is get a decent set of pipes and dynojet the bike and there you go, 120bhp on tap, that will make you have to hang on even more that you do now! Of course there are endless modifications and add-ons you can get for the XJR, just look in some of the accessory catalogues. The XJR1300 is a pure retro musclebike, it's based around the old air-cooled, upright riding style that requires some serious manhandling through the corners. On a modern sports bike you just have to think corner and it’s done, but the XJR requires a certain amount of forward planning to do that! Learning to ride and master this bike (yes you do need to) can be immensely more satisfying than riding the perfect line on a precision steering race-rep, that’s because the limits are so much more attainable on the XJR, it's you that's in control of the bike and not the other way round. The XJR is much like stepping back in time to days when the latest special was built by Harris and based on a Z1000 or GSXR1100, it has the looks and the brutish build of the Eddie Lawson style of racer, but has a lot of today's modern handling expertise built in. The Rear Ohlins work exceptionally well, they not only look great but do the job of keeping this giant on track, and they also have a lot of pose value, which is not a bad thing really! The front end is up rated but still a little on the soft side in reality, but with a bit of tweaking you can get it to compliment the back end - nearly. 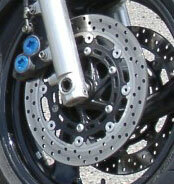 When it comes to stopping Yamaha have just about got the best brakes in the business, straight from the R1. These brakes with their one-piece calipers are used to stopping a 170mph superbike, ok so the R1 is much lighter but to stop this piece of heavy metal from it's top speed of 141mph is no problem at all. The braking power is just excellent from the R1 set-up and is delivered with a superb progressive feel. The overall handling of the XJR is very good for a bike that has a somewhat old-fashioned steel double cradle frame. It is a far cry from the frames of old which seemed to be made from a flexible material closely resembling black painted pasta! On most corners it will find its own line with a bit of movement here and there, but it's not unpredictable, and certainly not frightening. It is a very respectable handler indeed, with a little bit of a tustle and some countersteering and you get round the corners with ease, it only gets better the more you ride it. Soon you will tame the beast and then the fun starts! The engine is the heart of the bike, it has enough torque to pull a truck, it feels like your arms just keep getting longer when you accelerate on this bike, that is until you look at the speedo and realise your licence is now seriously at risk, so you back off. The best way to ride this bike is up to about 80mph, after that you really need to hang on, that's if you haven't got a mini-screen on it! All this said, and even though its raining the XJR1300 is still sitting there looking menacing and raring to go. With massive grunt and an incredible street presence it should be the hooligan bike of the decade, but it's not. 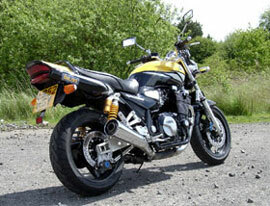 The Fazer 1000 or the Hornet 900 will wheelie and corner better than the XJR, no the big Yam's no wheelie machine and does lack a bit of ground clearance, but for sheer looks it has it every time. But as I said before here's a little warning - Bikes like this can get you in to serious trouble with the conservationists amongst us. If you really want to decimate the insect population to nil in your surrounding area, then get an XJR, a pressure washer and a large supply of visor tear-offs. 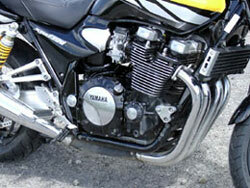 Bikes like this are best enjoyed by 'real men' (or women! ), devotees of the old school where fairings are sissy and windblast is king! Just make sure you don't wear an open face helmet, and carry lots of kitchen towel (reason coming up) with you when you go out on summer evenings. Oh and one more thing, make sure you take your jacket off before you go into the pub, dead flies attract more flies, and the tell-tale pile of dead insect parts you leave on the floor will put off any prospective pull, and believe you me you will on an XJR1300! !